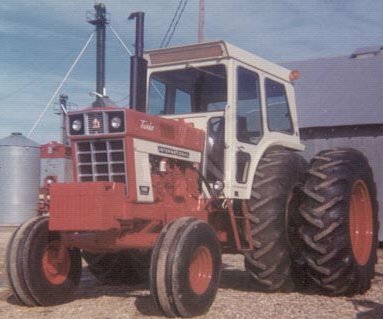 In 1973 I was very proud of this tractor and thought that modern agriculture couldn't get much better!!! I really had no idea of what was to come...monster tractors, steering by satellites, yield monitors, in-tractor computers, doubling of yields and Genetically Modified Organisms!!! This Steiger was powered by a 310 hp Cummins engine. A John Deere 4640 pulled a 16-row planter. In 1976, applying anhydrous ammonia(nitrogen fertilizer) was a much slower operation with a narrow applicator and a smaller tractor. 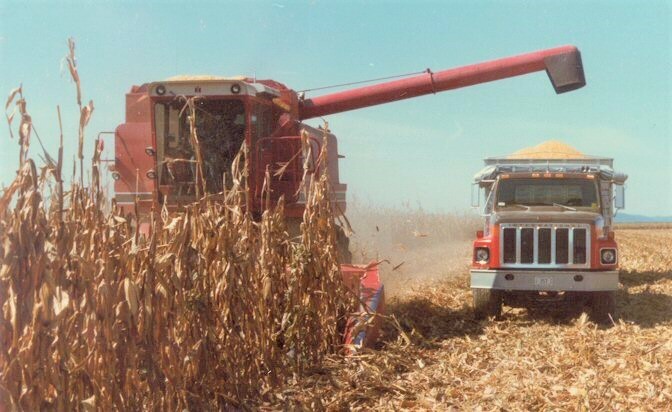 A International Harvestor 1480 combine with a 8-row header just filled an IH truck. We were using some M & W gravity flow wagons then, but soon quit because of limited capacity and slow transport speeds.